I’ve been asked to write a few recipes for SeeWoo of which I will also post here as a series. Last one was Seabass With Ginger, Spring Onion Soy Sauce & Fennel. It is certainly a pleasure to be playing around with Cantonese cuisine and I get to revisit some of my favourite things that I always order in a Chinese restaurant. The best meals are the ones that are the most simple. Nothing beats a simple plate of food and whats even better is that it hardly takes any effort or time to prepare. Separate the noodles and throw into some boiling water, blanch for about 2 minutes. Drain and rinse with hot water and dry out in a sieve or colander. For the sauce, pour about a tablespoon of light soy sauce, a teaspoon of cider vinegar and a teaspoon of sugar. Mix it and have a taste, fine tune the perfect balance of sweet, sour and salty. In a hot pan, add a dash of cooking oil or light olive oil and fry the shallots until they are golden brown and mix in the soy sauce mixture and remove from heat. Place the noodles into a bowl and pour over the soy sauce mixture, mixing well to cover all the noodles. Add a dash of seasame oil and toss well together. Blanch the kai lan in boiling water for about a minute, remove from heat and drain. 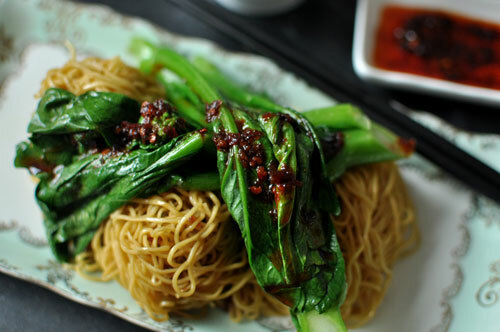 Drizzle with a little seasame oil or light olive oil and place on top of the noodles, adding a lovely chilli oil. I use Way-On Chilli Oil with Shrimp from SeeWoo.